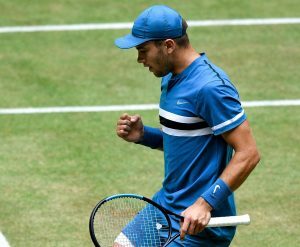 Result: Borna Coric defeated Roger Federer in Halle Open 2018 by 7-6(6), 3-6, 6-2. Both the players gave an absolute and outclass performance on the grass court today. The Croatian, Borna Coric took the lead in the first set and was extending it at a very fast pace. However, on the other hand, Roger Federer was also scoring points and soon the match came to a tie-breaker after the score was equalized 6-6. Borna Coric finally won the set on the tie-break when Roger Federer lost the last two points on his serve. The match moved on to the next set after Roger faced a shocking defeat from his opponent. Borna #Coric beats Roger #Federer 7-6 3-6 6-2 to win the Halle title! In the second set, Roger opened the scoring and was playing confidently this time. In the end, Borna Coric managed to get only three points and eventually lost the second set by three points. Qualify for knockout stages of World Cup by beating Argentina 3-0. Borna Coric beat Roger Federer to win Halle ATP title. Marin Cilic beat Novak Djokovic to win Queens ATP title. And I’m sure Sandra Perkovic did something amazing. Now it was all down to the third set. Borna Coric played brilliantly throughout the set and ultimately claimed the victory in this set. Roger Federer lost to 21-year-old Croatian Borna Coric 6-7 6-3 2-6 in the #HalleOpen final, in what would have been 99th title of his career! It was Federer’s first loss on grass in 21 games since losing to German Tommy Haas in the #MercedesCup at Stuttgart in June 2017. Roger Federer failed to clinch his 99th title from the Croatian and also lost his World No.1 ranking to Rafael Nadal. What an upset! @borna_coric defeats nine-time Halle champion Roger Federer 7-6(6), 3-6, 6-2 in the @GERRYWEBERWORLD final to lift his second #ATP 🏆. 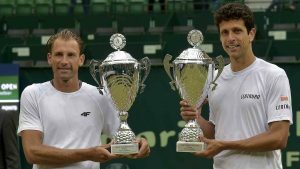 Result: Marcelo Melo and Lukasz Kubot defeated Alexander Zverev and Mischa Zverev in Halle Open 2018 by 7-6(1), 6-4. Marcelo Melo and Lukasz Kubot took a perfect start in the first set with a powerful shot. However, on the other hand, Alexander Zverev and Mischa Zverev were also scoring points at a very swift pace. After a tough battle between the two pairs, the set eventually came to a tie-breaker. It was a heartbreaking moment for the German fans as Alexander Zverev and Mischa Zverev both lost a total of four points on their serve, eventually losing the first set. The match moved on to the second set and this time Alexander Zverev and Mischa Zverev took the lead. However, both the pairs were playing confidently as the score reached 3-3. Alexander Zverev and Mischa Zverev lost this set too and again became runners-up in the Halle Open 2018 against Marcelo Melo and Lukasz Kubot. It was a great win for Marcelo and Lukasz as they again successfully defended their title against the German brothers.